Transcriptomic deconvolution in cancer and other heterogeneous tissues remains challenging. Available methods lack the ability to estimate both component-specific proportions and expression profiles for individual samples. 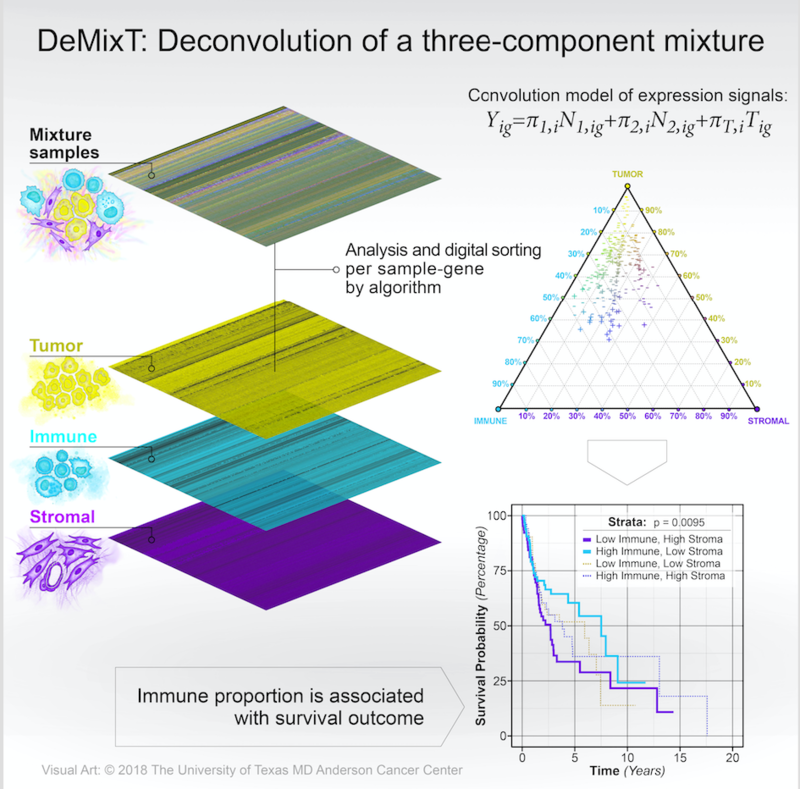 We develop a three-component deconvolution model, DeMixT, for expression data from a mixture of cancerous tissues, infiltrating immune cells and tumor microenvironment. DeMixT is a software package that performs deconvolution on transcriptome data from a mixture of two or three components. Knitr documentation for all analyses performed in the DeMixT manuscript (Wang et al.) can be found here. For users who have OpenMP installed. Please download DeMixT_0.2.tar.gz . The source file is compatible with Windows, Linux and macOS. For users who do not have OpenMP installed. Please download DeMixT_0.2.1.tar.gz . The source file is compatible with Windows, Linux and macOS. For the details about how to use DeMixT, please check the Manual . Github link for DeMixT source code: https://github.com/wwylab/DeMixTallmaterials . Our package is able to do parallel computing through OpenMP. For instruction on how to install OpenMP, please check the Instruction . DeMixT returns a list containing the deconvolved results.The res\$pi is a matrix giving the estimated proportions for each known component, so it is one-dimensional for a two-component deconvolution and two-dimensional for a three-component deconvolution. Proportions of the unknown component can be calculated by 1-colSums(res\$pi). res\$decovExprT, res\$decovExprN1 (res\$decovExprN2) give matrices of deconvolved expression profiles corresponding to unknown T-component and known N1-component (N2-component), respectively. The res\$decovMu and res\$decovSigma are two matrices of estimated $\mu$ and $\sigma$ for all the components. The deconvolved proportions and component-specific expression matrices (for each sample and each gene) for COAD, HNSC and PRAD are available. The deconvolved COAD three-component proportions: COAD_deconvolved_proportions.csv . 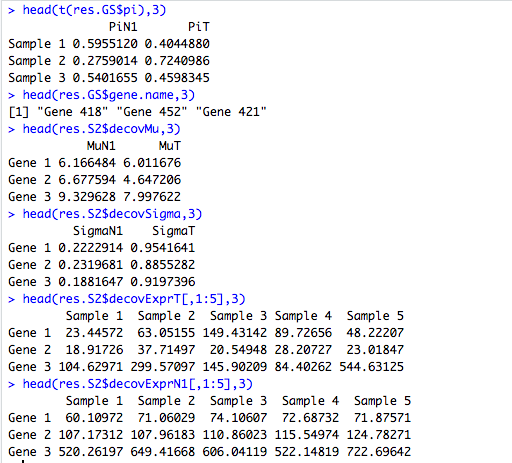 The deconvolved component-specific expression matrices: COAD_deconvolved_expression.RData . The deconvolved HNSC three-component proportions: HNSC_deconvolved_proportions.csv . The deconvolved component-specific expression matrices: HNSC_deconvolved_expression.RData . The deconvolved PRAD three-component proportions: PRAD_deconvolved_proportions.csv . The deconvolved component-specific expression matrices: PRAD_deconvolved_expression.RData . For questions or support related to the use of either the DeMixT R package or web app, please visit the project on GitHub . For other inquiries, please contact Wenyi Wang . This website is for educational and research purposes only.